‘Mpanatigghi biscuits are a specialty of the town of Modica in Sicily, and have a long history, as they were first brought to Sicily during the Spanish rule in the 16th century. In fact, the Sicilian dialect name ‘Mpanatigghi derives from the Spanish word empanada. 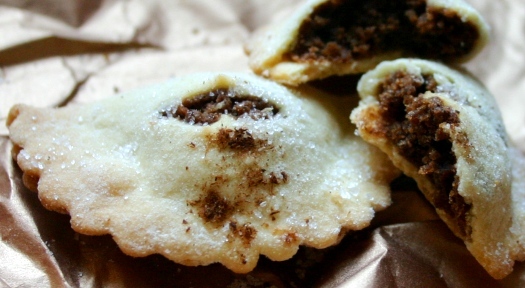 ‘Mpanatigghi are little half-moon shaped biscuits (or cookies) with a thin crust, that are stuffed with a mixture of sugar, chocolate, almonds, lemon peel, egg, cinnamon and vanilla, plus a secret ingredient that is impossible to detect – minced beef! If anything could be more unusual, these biscuits originally contained wild game. In case you are breathing a sigh of relief that you are vegetarian, there is also another version that substitutes the meat with eggplant. If these sound revolting, it is best to try them without knowing what you are eating, and in my experience everyone loves them- it’s only after being told what’s inside that people turn up their noses. It says something about food prejudices, no? One of the best places to sample ‘Mpanatigghi is the historic Bonjauto Chocolate Shop, in Modica. This is a favorite stop on our eastern Sicily walking and cooking tour where we taste lots of different chocolate items. And just for comparison, I recently tried the ‘Mpanatigghi from Casalindolci, which is convenient if you are staying at the Hotel Palazzo Failla, and was impressed with the thin crisp dough and the fragrant stuffing. Tip: Because non-Sicilians find this sweet to be unpronounceable, ‘Mpanatigghi are usually ordered by pointing at them. What a sweet memory , I recall as a little girl trying to stuff as many as possible into my mouth and hiding others in my apron that went over my dress. Had no idea what they were called and all but forgot about them as my mother never made them here in Canada. I think it was my Dad’s mom that made them. Nell- Glad to hear this post brought back sweet memories. Where were you as a child eating these?